I'm Loving Me Some EREC REX!! Yes, indeed, guys, this one has started out really, REALLY well!! Erec's best friend Bethany has been captured by the bad guy, mysterious strangers are after his twin siblings, and they've all had to put on UnderWear. You've got danger, magic, and Kaza Kingsley's trademark humor. Plus the stakes have been raised really high--the only way to rescue Bethany is to endanger the life of King Piter, Erec's father! And who is Dumpling Smith and why does she REALLY want the twins? Kaza Kingsley always has some tricks up her sleeve, so I know there will be some major surprises along the way. Oh, yeah, I'm gonna like this book!! That's right!!! THAT'S RIGHT!!! 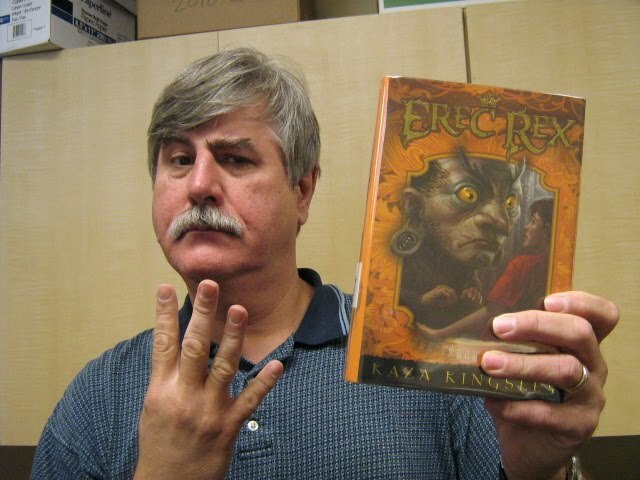 You see me here with my very own copy of Erec Rex: The Three Furies by Kaza Kinglsey. I am one very happy man! I've waited a LOOONNNGGG time for this! Gonna start this afternoon. Stay tuned, fellow reading fans! I will be like this for a while-- --and will let you know how I like it. ...is one terrific book! It's a quick read, the story moves right along, and there's enough action, suspense, and surprises to satisfy any guy. If you really enjoy reading, this is the book for you. If you're what the grownups call a reluctant reader (which means you'd rather take a beating with a very large tree limb than pick up a book), then this book is also for you! Here's the story--It's the time of the American Revolutionary War. 13-year-old Samuel lives with his parents in a little settlement in the Pennsylvania woods. They've heard stories of British soldiers attacking Concord, but that seems a long way off. Then, one day while he's out hunting, Samuel sees a column of smoke. When he realizes it's coming from where his home would be, he runs back to find...well, you'll just have to read to find out!! But I guarantee that you'll get caught up in the action!! This book grabs hold of you and makes you sit down and turn pages until the very end. You REALLY want to know what happens to our young hero. And, when you see what he goes through, you'll understand how much of a hero he becomes! Woods Runner by Gary Paulsen--this is one that you should not miss!! BTW, I'd recommend this book to our older reader guys. War is, by its nature, rough and brutal and the Revolutionary War was one of the roughest and most brutal. Although there isn't much graphic violence, what you read is startling. And some of it is very sad. That what war is, guys, and we do well to remember that. 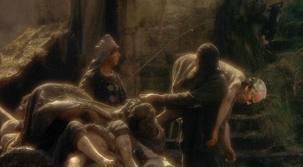 And we also do well to remember the sacrifices that people like Samuel made. Even though this is a fictional story, there were a great many brave people who endured hardships in the Revolutionary War. We have the right to read what we like because of them. Don't forget!! Guess what today is? Come on, betcha can't. Not in hundred years, you can't. Nope, not in a thou...what's that? You mean it's EREC REX 4 Day? How did you guess--oh, the title of this post. Well, you see that today's a day worth getting excited about! 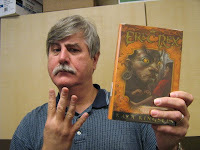 It 's the release day for Erec Rex: The Three Furies by the amazing Kaza Kingsley . 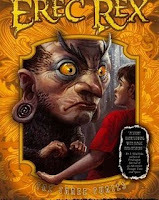 The Erec Rex books are some of my absolute favorites and you shouldn't miss them!! It would take too long to tell you all the great things I could about them, so go over to the "Labels" section on the left-hand side of the page, click on "Erec Rex," and see for yourself. We won't get The Three Furies at the library today because it takes longer for us to receive and process books than the bookstores--but this also means it can't be too long before I see my very own copy!! CAN'T WAIT!!! Hey, guys, this is the ever-busy CARLMAN letting you know that I'm not dead yet. All the changes with the library mean we have to do a lot more than before. Which means that I don't get as much time to read or blog as before. Which means that there will probably be longer times between posts this summer. But never fear--the CARLMAN has been faithfully spreading the word about this blog to all the boys I can here at the Myers Park Library and we may hear from one of them at any time! In the meantime, I've got a few books checked out. One is Woods Runner by Gary Paulsen. All reader guys know that Mr. Paulsen is one of the very best authors for guys out there. (His book Hatchet made our Manliest Books for Boys Giveaway list as well as the Books Every Guy Should Read list. Another book, Lawn Boy, is an extremely funny read!) Woods Runner is about 13-year old Samuel and the Revolutionary War. I'm about 1/4th of the way through and it is intense! Can't wait to finish it. 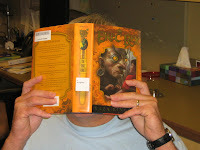 Another is The Dangerous Book of Heroes by Conn and David Iggulden. It's full of stories about famous people such as George Washington, Lawrence of Arabia, and Harry Houdini, as well as not-so famous heroes as Alcock and Brown or the men of Colditz. I'm reading thechapter on George Washington and it's amazing. Can't wait to finish this one either. There you go. Hope to give you full reports when I finish. What about YOU? What are you reading this summer? Hit that "Comment" button below and tell us. Any guy who sends a review gets a free book! And don't forget about the giveaways going on this summer. Take a look at the top of the left-hand side of the page to find out. And, since it's summer, let's have some summer fun. Here's a goofball video for you by Spike Jones and His City Slickers. Spike is one of my all-time favorite performers and one of the funniest guys ever to pick up an instrument. He took popular songs of the day (this was waaayyy back in the day) and did all sorts of crazy things with them. Sort of a Weird Al before there as a Weird Al. Here he does "Sabre Dance", a classical piece that a lot of circus performers used as background music. But it never sounded like this! And here's Weird Al talking about Spike Jones! OK, keep readin' and enjoyin' your summer!